This past Friday, the Maui County Council received the mayor’s proposed budget for fiscal year 2019, which runs from July 1 through June 30, 2019. As mandated by the County Charter, the mayor must present the council with a proposed budget for the upcoming fiscal year by March 25. In turn, the council must pass a balanced budget by June 10. If not, the mayor’s budget automatically becomes law. The budget is composed of two parts. The first is an operating budget, which outlines the salary, operations and equipment for each county department. This also includes grants intended to be awarded to community organizations. The second part of the budget consists of larger-scale projects, known as capital improvement projects, such as road or sewer improvements or the construction of new buildings. These projects often use bond funding, or borrowed money, to complete projects that will be paid off over time. Council committee members meticulously review each program request to determine what can be funded with available resources. This includes assessing whether a request should stay the same, be reduced, expanded, or if resources should be transferred and used in a better way. Negotiating a budget is a tough process with tight deadlines and usually requires deliberations that last late into the night. This is the only opportunity for council members to provide direct input on the budget. Once signed into law by the mayor, any further changes may only be initiated by the mayor. Several council committees have already received overview presentations of departmental operations, including items on their wish list for the next fiscal year. The Budget and Finance Committee, chaired by Riki Hokama, will also engage the community in a countywide outreach effort to receive comments on funding priorities. • March 29, Kihei Community Center, Main Hall, 303 E. Lipoa St., Kihei. • April 2, West Maui Senior Center, 788 Pauoa St., Lahaina. • April 4, Mayor Hannibal Tavares Community Center, Social Hall, 91 Pukalani St., Pukalani. • April 9, Lanai Senior Center, 309 7th St., Lanai City. • April 12, Helene Hall, 150 Keawa Place, Hana. • April 16, Mitchell Pauole Community Center, Social Hall, 90 Ainoa St., Kaunakakai. All district meetings are scheduled to begin at 6 p.m., except for the Molokai district meeting, which will begin at 6:30 p.m. 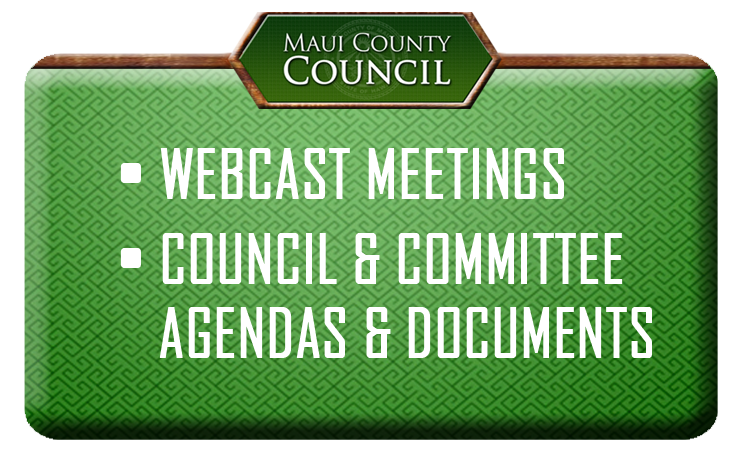 In lieu of a specific district meeting, residents of Central Maui are encouraged to attend the council’s public hearing on April 18 at 6 p.m., in the Council Chambers, 200 S. High St., eighth floor, Wailuku. Both oral and written testimony is encouraged for each meeting. Throughout the budgeting process, the council will decide how your taxpayer dollars will be spent. Public testimony is the best indicator of the community’s priorities. Written testimony is also accepted via email at bf.committee@mauicounty.us. For more information, visit www.mauicounty.us/2019budget. Review and passage of a balanced annual budget is one of the council’s most important responsibilities. Many difficult decisions will be made, including how much revenue should be raised from the tax base and, in turn, what priorities should be funded. I encourage the public to participate in this process, which concludes in June, to ensure county funds are spent with the greatest benefit to our community.